Spring is here! The weather is warming up so we can fire up the grill and eat outside with family and friends. I always like to have fresh veggies when throwing a party. They add the crunch and color factor to any table and plate. 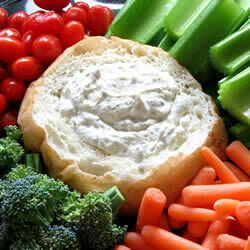 This Dill Dip is a family recipe from my friend Marla Husky who was so kind to share it with me. I think you will flip over it as much as I did. Mix the following ingredients together in a bowl until smooth in consistancy then serve cold…surrounded by your choice of fresh veggies.